The Shore Conference first began awarding hockey titles in 2003-04, when the additions of Red Bank Regional and Point Pleasant Borough gave the league 16 hockey-playing schools. Ten years later, after seemingly constant changes and adjustments to its hockey format, the Shore Conference has broken with New Jersey hockey precedent by announcing its intention to run a 16-team Shore Conference Tournament and determine a single champion, as it does in most other sports. Previously, Shore teams had been assigned as eligible to compete in either the Handchen Cup or the Dowd Cup. Both trophies had been awarded by the New Jersey Ice Hockey League, with the Handchen Cup dating back as far as 1985, and were adopted by the Shore Conference when its hockey divisions were formed in 2007-08. Prior to the current school year, however, the conference’s executive committee voted to inaugurate a 16-team playoff format to determine one Shore Conference champion. The document detailing the format is available via this link. “Last year, the Shore Conference voted to eliminate the Handchen and Dowd Cups and align with the other Shore Conference tournaments,” tournament director and Brick Township Director of Athletics Rick Handchen wrote in an email on Friday. The now-retired Handchen Cup is named for Rick Handchen’s father, and he expressed fondness for the tradition of both tournament trophies. The move is likely to be unpopular with the hockey community, because some of the early-round games will be mismatches, and less competitive programs would prefer the chance to compete for a cup championship against schools with similar abilities in ice hockey. A play-off series shall be of a single elimination type not to exceed eight (8) teams and limited to a maximum of three (3) games [per team]. The Shore Conference Tournament clearly does not meet these parameters. It will have 16 teams, and the two teams playing in the final will play four games each. However, two other playoff tournaments and one in-season tournament already fail to meet these guidelines. The Gordon Cup tournament has included 10 teams since 2010, and the Mercer County Tournament has had as many as 15 teams in some editions, though the number is usually closer to 13. There shall be no overtime periods except in league playoffs, regular season tournaments, the NJSIAA state tournament or when playing out of state. For games that require a team to advance, a 15 minute overtime and shootout procedure must be used. For final or championship games, a 15 minute overtime must be used. A shootout shall not be allowed. When asked about the discrepancies with NJSIAA rules both in number of games in the tournament and in the length of the overtimes, tournament director Handchen cited limited ice time as the reason for five-minute overtime periods and said the Shore Conference executive committee has approved the tournament rules. While the tournament’s regulations do technically violate NJSIAA protocol, it seems unlikely that any changes will be made this year. The tournament games are spaced such that no team will violate the three-games-per-week regulation, and no team is in danger of exceeding the 26-game maximum prior to the state tournament. The Shore has another hockey rink to host high school games this winter, as Middletown Ice World has opened at the Middletown Swim Club and will play host to both Middletown North and Middletown South. 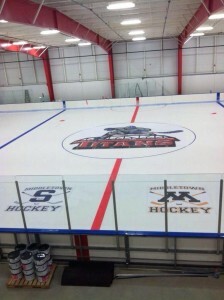 While its primary tenant, junior hockey’s Titans, get the coveted center-ice logo placement, the Eagles and Lions do get their logos on the fresh sheet as well. Here are articles on the opening from the Asbury Park Press and the Middletown Independent. The NJSIAA has thoughtfully released its classifications for the 2013-14 year via its web site, and they always make for fascinating reading. The key when considering hockey implications is the distinction between Public A and Public B. I currently expect there to be 103 102 teams on the public school side next year, so there will be 51 in Public A and 51 in Public B. However, there are some factors to consider other than pure enrollment. Last year, the NJSIAA made the decision to place all co-op programs in the Public A field. While I disagree with that decision, I do understand its logic. However, I believe most coaches were not informed until the season was well underway (if they were informed at all), and so I hope the Public A / B split will be a little more transparent from the beginning this year. With those changes come at least three new co-ops in 2013-14 (and several others are allowed to stay). Here’s the NorthJersey.com story on Lyndhurst and Paramus and its story on Old Tappan and Hasbrouck Heights. And the Trentonian article on Nottingham and Hamilton. Those three co-ops will drop several teams down into the Public B ranks for 2013-14. I got a Thursday afternoon update that J.P. Stevens and Edison, both Group IV schools with struggling programs, intend to co-op in 2013-14. All lists below are assuming that co-op agreement goes through. As a reminder, NJSIAA enrollment figures are the number of students expected in grades 10-12 for the upcoming year, NOT the school’s total enrollment.